The connection of the Haftorah to the second Shabbat Chanukah: This Shabbat is very special because we are celebrating a second Shabbat Chanukah. (There is no connection between the Parsha and the Haftorah). This Haftorah was selected because it includes a reference to the Menorah in the first Beit Hamikdash. The storyline of this week’s Haftorah: Chiram*, hired by King Solomon, as the Michelangelo of his time, fashioned the Temple treasures from brass/copper. Chiram makes small basins for removing the ashes from the altar, the rakes for raking the ashes, and the bowls to sprinkle the blood of the sacrifices on the side of the altar. They were made in the plains of the Jordan, actually to the east of the Jordan in the tribe of Gad’s territory. Chiram had a factory there and he was able to cast them in dense clay molds. The location of this factory was between the city of Sukkot and Zarothan. So many utensils were manufactured that King Solomon left off counting them. The weight of the copper was never determined. Yachin & U’boaz were two giant columns, each topped with a crown that stood at the entranceway of the Temple. As a part of the crown of the columns, two rows of pomegranate designs were placed- 400 in all. The Haftorah describes the Mikveh, “sea”, a very large basin with twelve cattle arranged in four rows of three at the base. It was used for the Kohen to immerse himself in when performing the priestly work in the Temple. Solomon made all the utensils that were for the House of Hashem: the Golden Altar and the table upon it which held The “Lechem Hapanim”, Show Bread, - 12 loaves of bread made of gold. The Menorah: There were five menorahs on the right side of the temple and five on the left side. 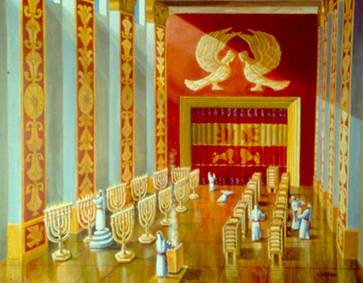 A total of 10 Menorahs were in front of the dividing wall of the inner Sanctuary of the Temple. Each of the 7 lamps on the menorah was decorated with a flower pattern on it. All the work of King Solomon Temple was now completed. Then King Solomon brought the Holy things of his father King David. There were silver and gold. He put them in the treasury of the Temple. There were: Tzippot Mezamrot, something to do with a musical instrument; bowls, spoons, fire pans made of pure gold, keys of the doors to the Holy of Holies. The doors of the sanctuary were of gold. Instituted, among others, the two mitzvot of Eiruv and Nitelat Yadayim (the ritual washing of hands) and the third blessing in Birkat Hamazon, Bonei Yerusahalayim. The Eiruv is a string surrounding an outer perimeter of an area thus designating it as a permissible place to carry things on Shabbat. Mishlay, Proverbs, which concludes with the song Aishet Chayil sung on Erev Shabbat. Shir Hashirim, Song of Songs. Famous Phrases: Mishlay, 4:22, “Ki chayim haim l’motzaihem ul’chol b’saro marpeh” “For they (the words of Torah) are life for those who find them, and for all of the flesh, a cure”. Timeline: This Haftorah takes place around 1000 B.C.E. Map: This Haftorah takes place in Jerusalem.